I have never had any luck acquiring clothing from Wiksten, and I was pleased when I heard that Jenny Gordy had designed a pattern for Stitch magazine. 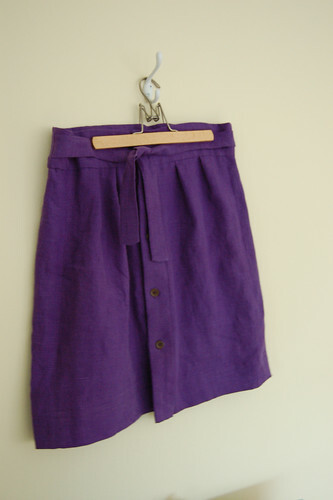 I had purple linen, and since I have always loved the Alison skirt from Wiksten, I used it for my version. That might make me unoriginal, but I do love that material and that colour. It was a nice skirt to make. On the pattern sheet the front and back pieces are mislabeled, but otherwise the fit was fine and the instructions were easy to understand (the cutting directions say to cut 2 self, 2 facing pieces for the placket, but I ended up using 2 pieces only -- I'm not sure if i did it wrong or not, but it made sense to me). I hemmed it a little shorter, because I am 5'3", and I took out one of the buttons. I did make one big mistake, though, which I will blame on feeling a little unwell and on being tired: when I was making the skirt I tried it on and thought it was too big. I cut a few inches from the front, where the plackets are... I had completely forgotten about the pleats! It ended up working out, but the seams are a little pulled to the front. If I were to make it again, I would baste the pleats in place early on in the process. I felt very silly indeed, forgetting about such a major design feature. My friend Jennie wanted me to teach her how to sew (knowing I am not a seamstress, of course), and we made the skirt together in a navy blue twill. She has never made a garment before -- in fact, she had only made a pillowcase during the sewing essentials class at the Workroom. We cut the pieces together, but she did all the sewing and most of the hand-stitching; I sewed in the buttonholes, because my machine's buttonholer is fussy and unfriendly. We had a small serger mishap (whoops), but it went well otherwise and she finished the skirt in one Magic Oven pizza-fueled evening. I am very proud of her. I was amazed at how much her confidence grew in a matter of hours! That purple is heavenly. I really want to make Martha's skirt, the one on the cover. I still need to pick up the magazine though--thanks for the reminder! ooh! It looks so pretty! Buttonholes scare me, I haven't even tried them yet. Yours look beautiful. i love that shade of purple! it sounds like you had such a fun evening of sewing and pizza. regardless of your tiny 'mistakes,' that's still a lot better than i could do! and now you have a lovely new skirt to wear year round. its lovely! i wish i had someone here to help me make my first garment. owning one of Jenny Gordy's pieces is such an honor! I hope you get to one day :) Until then, you seem to making her samples just fine! hi! i love your etsy shop and just happily stumbled upon your blog. just wanted to say hello! Ambika: I ordered it online, which is good because I am impatient and I have yet to see it on newsstands! Erica: You are such a dear! And of course you can! We can get all your favourite toppings because I like them all. Erica: I went through a period where I didn't like purple at all (too goth, too... ecclesiastical), but I love it again. Especially in shades of plum and mauve! Thank you! April: There were also nachos! "Carnival" coloured ones! Hi there, Forest Bound! I love your Etsy shop! What issue is the tulip skirt in? Love it!